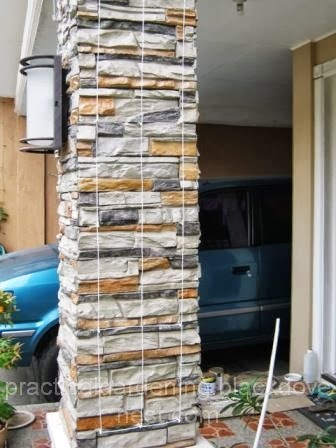 Faux stone panels have long been used as decorative siding tiles on walls and masonry projects. The tiles, which give the impression of stones joined together, adds a 3-dimensional interesting texture to an otherwise smooth and plain structure like a wall or post. For some, a structure decorated with faux stone panel tiles is enough. 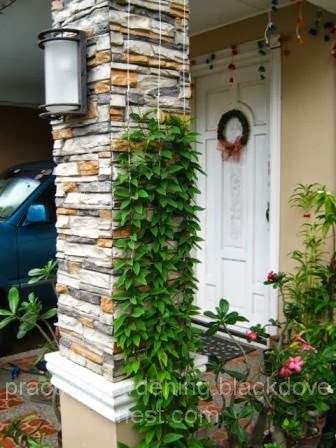 For eager gardeners however, adorning such decorated structures with trellised vines adds the nice green accent of natural foliage to the cold facade of stone. 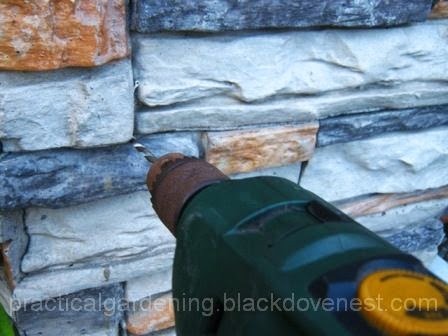 Assembling a garden wire trellis on faux stone panel isn't difficult. It's mostly a matter of knowing the properties or characteristics of faux stone panels, which will allow you to find the suitable wall anchors and their placement on the panel. 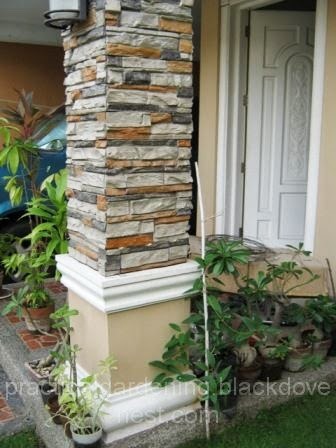 The photo above shows a square post in our porch that has faux stone panel for its siding. On the right side is a Tristellateia australasiae vine, also called Maiden's Jealousy or Shower of Gold. It is potted in a temporary black plastic pot but will eventually be planted in ground at the base of the porch post. The white thin bamboo pole is a temporary support. Faux stone exactly imitates the genuine look of natural stone. However, it does not depend on nature for its supply and is abundantly available due to its mass production. It is sometimes referred to various names such as Faux Rock Siding, Simulated Stone, Stone Veneer, Manufactured Stone, Architectural Stone and many others. Faux stone is actually made of concrete (and some with polymers) which makes it so economical. Real stone is so much heavier compared to concrete. The faux stone is fashioned out of moulds and therefore actually have similar patterns. It is up to the installers to cut and make placements to make the stones appear randomly laid..and more difficult to install. Aside from the texture, the beauty of faux stone also lies in its colors. Faux stone can have a color scheme which can be pleasing. The stones seem to be carefully chosen for their similar colors. The colors however are only surface deep, because faux stone is simply made of concrete. Some contractors add a coat of clear varnish to make the stones shiny. Faux stone are essentially concrete tiles with patterns. Since faux stone is light, installation is fast and easy. Natural stone installation is more intricate and meticulous. Although the stone placement in faux stone appears random, the joining of tiles can have a defined simple pattern. 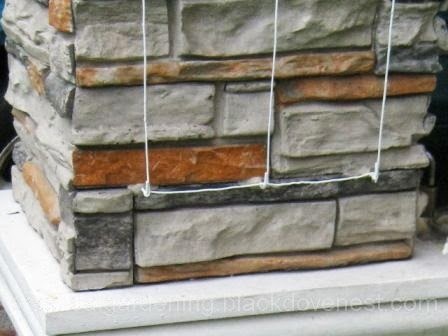 Knowing the characteristics of faux stone, you're now ready to mount a garden wire trellis on the faux stone siding. L-Hooks or Long Screws - These will act as anchors to mount the whole trellis structure. Clay Epoxy - Used for cementing the anchors to the faux stone panel. Determine the joints where to place the garden trellis anchors. 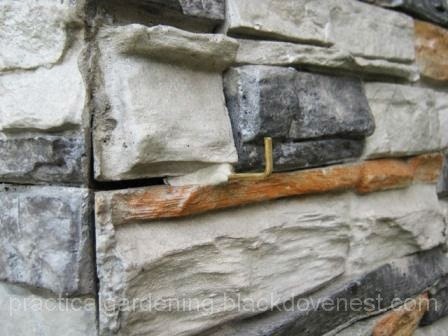 It's much easier to position the anchors at the joints, or where 2 or 3 faux stone tiles are joined. The gaps provide space where to position the anchors. The photo below shows possible joints (encircled in yellow) where to position the garden trellis anchors. Position and insert the garden trellis anchors into the identified joints. The garden trellis anchors' screw or threaded part should fit inside the gap as shown below. It should be horizontally straight and not slant in an awkward angle. Use a power drill if the joint gap has a too small diameter, too shallow or is not straight. 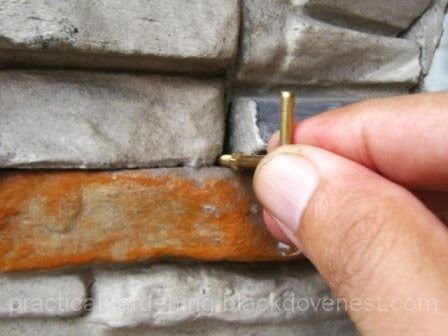 Avoid drilling directly into the faux stones and never use a hammer to hit a nail into the stone. Faux stone is mainly concrete and could easily crack with enough stress. Once the the garden trellis anchors fit in all the joints, use clay epoxy to cement the threaded part of the anchors into the joints. Allow the epoxy to completely cure and dry. Shown below is one of the mounted anchors. Notice the clay epoxy's color blends well with the faux stone. Use the steel wire to tightly connect all the mounted garden trellis anchors. Ensure there is minimal slack in the steel wire. Paint the steel wire as well as the garden trellis anchors. Shown below is the bottom part of the garden trellis. Here's the completed garden trellis as it is mounted on the porch's post with the faux stone siding. As an option, you can put a trellis starter at the bottom to help your young vine reach the trellis. After a few months, here's the Tristellateia australasiae vine or Maiden's Jealousy well established in the garden trellis. Thanx, and thanx for visiting.